Take 1 capsule a day, or as instructed by a specialist. Vitamin K and Vitamin D work synergistically and greatly improve the structure of the bones. As a dietary supplement we recommend taking the product containing vitamin K, together with the preparation of vitamin D. These compounds are fat-soluble vitamins, so you should consume them during rich in fat meals. 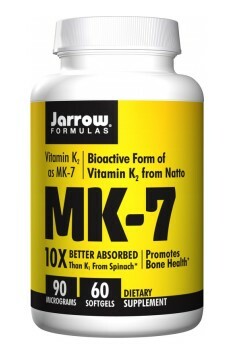 The minimum effective dose of vitamin K2 as menaquinone of MK - 7 is 90-360 mcg. Studies on its recommended intake is still ongoing, so I suggest taking 90 mcg per day (1 capsule).